Two sine waves travel in the same direction in a medium. The amplitude of each wave is A, and the phase difference between the two is 180°. 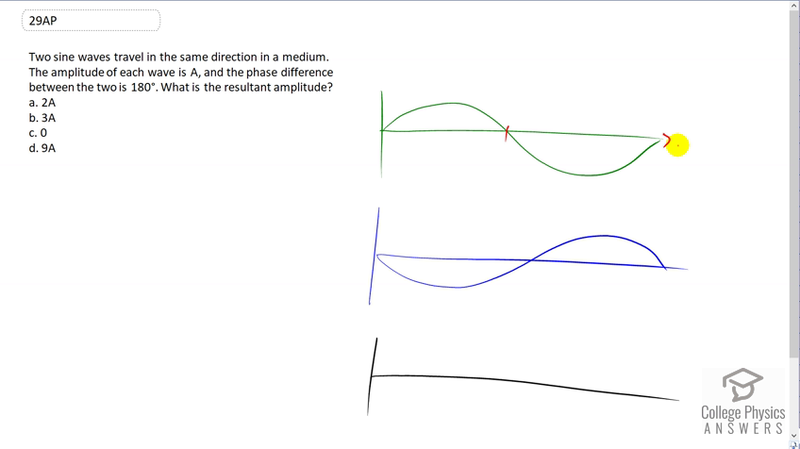 What is the resultant amplitude? This is College Physics Answers with Shaun Dychko. Drawn here are two waves that are 180 degrees out of phase. Now, if this access was in degrees, this would be 180 degrees here for this node is. And this would be, this is the graph of y equals sine x. And if you were to move it 180 degrees, then let's say we move it to the left then you would be moving this anti-node here, here. And this anti-node here which is negative amplitude is in the same position as this anti-node here which has position of positive A. And positive A and negative A makes zero and this node, this meant to line up to this node here in the drawing and of course makes zero. And this negative A plus this positive A makes zero. And all along these two waves when you add their positions together, you're always going to get zero. And so they are going to cancel each other out. And answer is c.